In this application the speakers are mounted in-wall or in-ceiling and this has a significant effect on the sound that reaches the listener. for example, the wall will often vibrate along with the speaker causing colouration, or the speakers may often be mounted in non-ideal locations placing great reliance on a smooth 'off-axis' response. 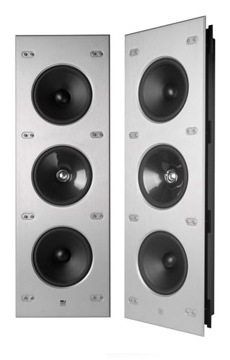 The 'outdoor' speaker category is one where particular attention needs to be paid to the balancing, as there are often only two boundaries – the ground and a wall – as opposed to the six in an enclosed listening room, so the bass does not get the same level of reinforcement, and without reflection of high frequency energy from the boundaries the treble is also restricted to the region directly in front of the speaker. Many custom installation systems will be used for public address purposes where speech intelligibility is of primary importance, and this may have a significant impact on the subjective balance chosen.